As public and political scrutiny of drug prices continues, pharmaceutical companies are increasingly encountering new governmental efforts to control rising drug costs. At the federal level, this scrutiny resulted in the publication of the Trump administration’s American Patients First blueprint last year. While the major reforms proposed in the document would likely require legislative changes at the federal level, a growing number of states are already taking action aimed at reducing drug prices1. As manufacturers seek to build out commercialization strategies for new therapies and to manage the performance of existing products, this patchwork of state policies and laws may become an increasingly important consideration. States have taken a variety of approaches to either directly or indirectly control prices and overall drug expenditure, with at least 14 measures introduced across 10 states since 2016. 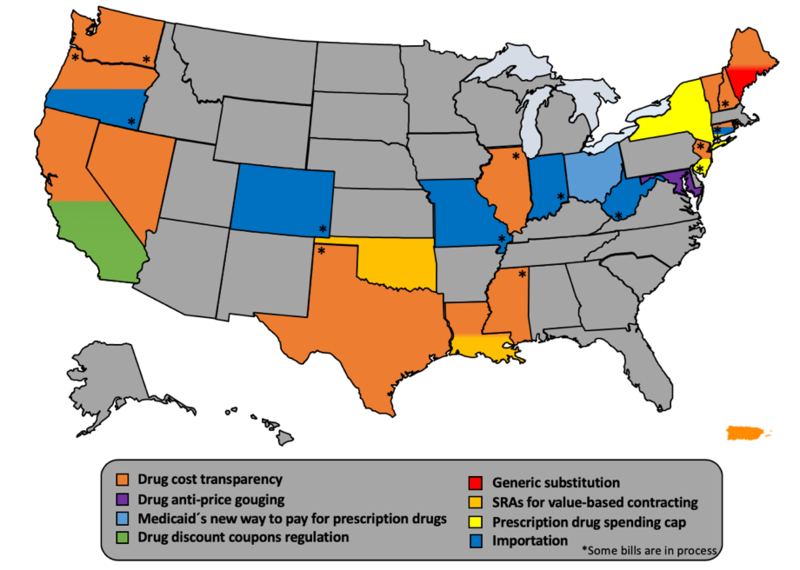 Among the legislation introduced, drug cost transparency laws are the most common. Several states including California, Vermont, and Nevada have enacted laws that require pharmaceutical manufacturers to submit advance notification of price increases for prescription drugs that are currently in the market, and a justification of both those increases and launch prices of new drugs. While not directly regulating prices, these laws are intended to increase public awareness and pressure in an effort to incentivize manufacturers to exercise restraint when setting launch prices or taking price increases 1. Other state Medicaid programs have taken a more direct approach to control drug prices and their overall budgetary impact by leveraging supplemental rebate agreements (SRAs) to directly negotiate innovative contracting options with manufacturers. SRAs are exempt from Medicaid “best price” calculations, which allows manufacturers to assess novel contracting opportunities without fear of dramatically impacting their nationwide Medicaid best price.3 Oklahoma is one of the first states to explore this opportunity by inking a value-based Medicaid purchasing contract with Alkermes for the schizophrenia drug Aristada. Compliance is often a significant challenge with schizophrenia medications resulting in lost sales for the manufacturer, worse health outcomes for the patient and ultimately higher costs to the payer. Accordingly, Alkermes and Oklahoma have sought to address this with a contract that will progressively reduce the cost of Aristada so long as the prescription is filled every month which provides the state additional incentive to devote resources to ensuring patients are compliant and reach treatment goals4. Michigan and Colorado have both been approved by CMS to enter into similar value-based programs in what may be the beginning of a trend among state Medicaid programs5. Recently, Louisiana has taken a different approach to leverage the contracting freedom provided by its SRA, to explore a subscription-based payment model for Hepatitis C drugs. Under the proposal, Louisiana would pay a monthly or yearly “subscription fee” to a drug manufacturer or manufacturers for unlimited access to a specified treatment for individuals enrolled in the state’s Medicaid program or in Louisiana’s correctional system. The payment will be equal to or less than what the state is currently spending to treat these populations, and the manufacturer will have access to patients who would not have received the treatment otherwise1. Continuing the trend in California, recently elected Governor Gavin Newsom has also signaled willingness to use SRAs to directly engage manufacturers in order to address the state’s rising prescription drug costs. In a recently released executive order, Newsom seeks to transition all pharmacy services for Medi-Cal managed care to a fee-for-service benefit, in order to consolidate drug purchasing and “create significant negotiating leverage” with manufacturers6. This bulk purchasing program in and of itself is not novel – multiple states have explored similar approaches and California already negotiates SRAs7. Pooling all of the approximately 13 million Californians covered by Medi-Cal increases purchasing power but without the ability to exclude drugs from formulary, negotiating leverage may remain limited—federal law requires that most drugs from manufacturers participating the Medicaid Drug Rebate Program (MDRP) be covered. The implementation of more novel aspects of the order, such as exploring the potential for private purchasers to access the State’s bulk purchasing program, are likely to remain unclear until further details are released in a series of reports due out this spring. With continuing public pressure to address rising drug costs, states have demonstrated a willingness to implement novel approaches intended to control their overall drug expenditure through both direct and indirect means. Programs such as those being explored in Louisiana and Oklahoma may offer manufacturers the opportunity partner with states in order to ensure greater patient access to medications, while price transparency laws may necessitate a renewed focus on communicating the therapeutic value of those medications. As manufacturers bring innovative therapies to market, the ability to navigate the evolving landscape of state policies and regulations will play an increasingly important role in a successful commercialization strategy. Bill Shimp is a Director in Jupiter’s San Francisco based practice and Anna Tena is a Research Analyst in the Costa Rica office.